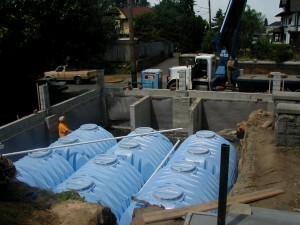 We are accredited and licensed rainwater collection contractors / installers. All onsite management & installation of rainwater collection and storage systems are by ARCSA accredited and licensed installers. We offer turn key solutions & guarantee our work. 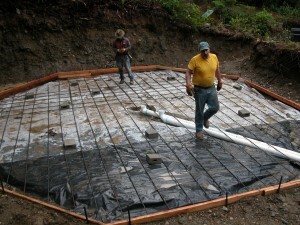 Rainwater Collection Contractors: Our complete solutions include: design & permitting, site preparation including excavation and concrete foundation pads when required. We specify and order all materials and components delivered to your location and install, finalize and test your system. All components carry manufacturer’s warranties, and we only specify the most reliable and the best. RainBank guarantees its installation and workmanship for one year. 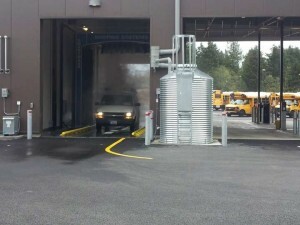 Meeting the needs of commercial customers, Federal Way School District uses rainwater for bus wash down. When the lawn is installed and grows, you would never know there is a rainwater collection system down there!